There's a new Ebook I have just come across which I predict will become very popular. It presents a strategy for selling any type of product using methods which will never become obsolete. Plus an ingenious twist which will send your traffic rocketing. The Ultimate SuperTip, written by Harvey Segal (Mr SuperTips) is neatly set out, easy to follow, written without hype and not littered with annoying links. And the cost of this book ? This morning, as I was driving in Bangsar, I saw this new signage and managed to take a snap of it. The visual is not appealing and professional at all. I thank god for giving me the strength and courage to go through everything with the support of my wife, parents and family. I couldn't agree more with the saying that you would not know how good your thoughts and plans are until you act on them. It's the ACTION that counts. 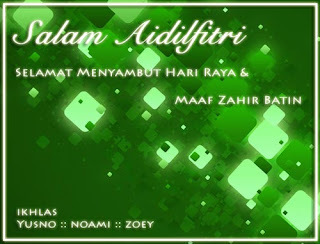 Happy Eid to my family, relatives, friends and my fellow bloggers and readers.